Jim Charles as Sweeney Todd at the Cohoes Music Hall. All photos by Charles T. O’Clair. The company of Sweeney Todd does a great job with a challenging musical. 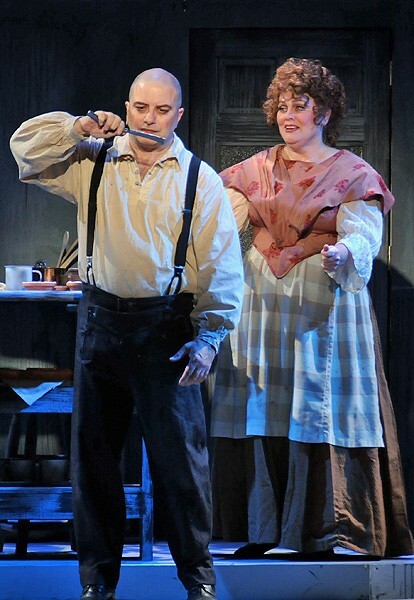 Jim Charles and Monica M. Wemitt set up shop together as Sweeney Todd and Mrs. Lovett. 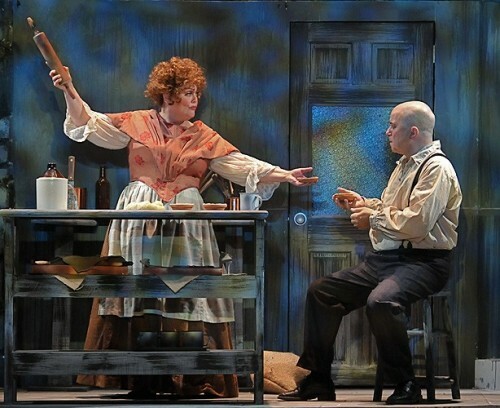 Mrs. Lovett (Monica Wemitt) tells Sweeney Todd (Jim Charles) that she makes "the worst pies in London." At the end, the bodies pile up down below as Sweeney Todd raises his razor high, his murder spree complete. Or is it? Production photos by Charles T. O’Clair. With the help of a lot of neighbors and friends,Jim Charles (R) and Tony Rivera (L) have brought musical theatre to Cohoes, New York. 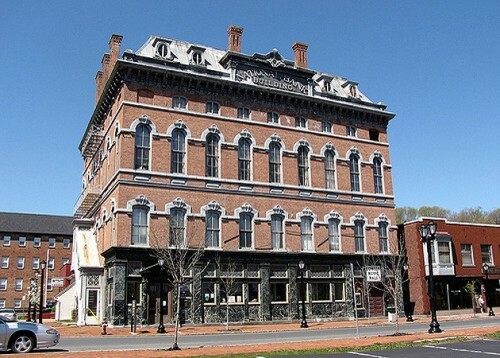 The exterior of the Cohoes Music Hall Building. The interior of the historic Cohoes Music Hall built in 1874. Sweeney Todd at Cohoes Music Hall with Jim Charles. 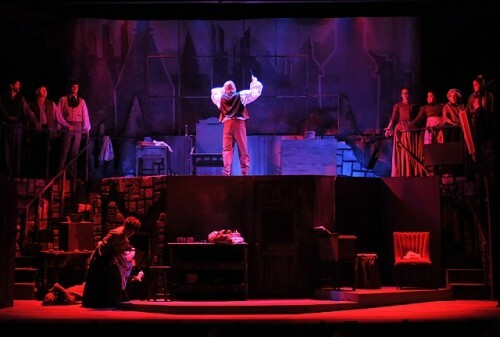 Cohoes Music Hall, Home of C-R Productions presents Sweeney Todd, The Demon Barber of Fleet Street, A Musical Thriller. Music and Lyrics by Stephen Sondheim, Book by Hugh Wheeler, From an adaptation by Christopher Bond. Sponsored by Michelle A. Santucci. Directed by Jerry Christakos. Production Stage Manager - Kim Crawley, Scenic Designer - Christina Williams, Lighting Designer - Shawn Boyle, Costume Designer - Lena Sands, Wig Designer - Kim Stone, Sound Designer - Nathan Meredith, Master Electrician/Master Carpenter - Louis Buehling, Carpenters - Andrew Wozniak, Mike Graziano, Eric Wolff, Spot Light Operators - Monica Wozniak, Tommy Swimm, Wardrobe Supervisor - Khryn Rigney, Graphic Artist - Gayla Ferrari, Development & Communications Coordinator - Gilli Van Deusen. Cast: Sweeney Todd - Jim Charles, Mrs. Lovett - Monica M. Wemitt, Anthony - Brendan Hoffman, Johanna - lauren-Rose King, Tobias - Dan Lawler, Judge Turpin - Glenn Wall , Beadle Bamford - Joseph London, Pirelli - Adrian Gleason, Begger Woman - Mary Elizabeth Milton. Ensemble: Dave Dixon, Ann Marie Drabek, Elizabeth Hoffman, Jon Meredith, Rick Reed, Corie Rowe, Eric Wolff, Janie Wallace. Our region has dozens of flourishing theater companies. This review is part of our ongoing efforts to bring the best of them to the attention of our wide range of readers. It takes not only courage but a lot of resources to stage a live production of Steven Sondheim's complex, 1979 musical Sweeney Todd. It broke all the rules of musical theatre. Not only does it have one of the most complex of his musical scores, but also an usual number of scenes. Given that the Cohoes, NY Music Hall stage is small, and the resources of C-R Productions limited, they have pulled off a minor miracle in doing such a good, if not perfect job. The huge production requires 17 actors on stage and 6 musicians in the pit. This formidable force will only be on stage through October 25. Until 2002 when Jim Charles - who plays the title role of Sweeney Todd - and his partner, Tony Rivera arrived in Cohoes, New York, there wasn't much cultural activity in the once famous Spindle City. Encouraged by the community to settle there, the couple quickly set to work and formed C-R Productions. The nonprofit produces a steady diet of musicals in the Cohoes Music Hall that was built in 1874 The Music Hall is located on the third floor of a multi-purpose, historic building. Cohoes has not been the same since. Those of us in the Berkshires had the joy of seeing their top notch production of The Producers this past June at the Colonial Theatre in Pittsfield. It was the best musical of the Berkshire summer. Visiting them on their home turf of Cohoes - about an hour from Williamstown - found us in a far more communal setting than usual. Volunteers circulated before the show, hawking 50/50 tickets. Residents eagerly searched the program for their names. The pre-curtain announcements involved not only a request to silence cell phones, but an invitation to sponsor wine & cheese and jewelry parties in support of the company. Theater doesn't get more grass roots, spirited, and down to earth than this. 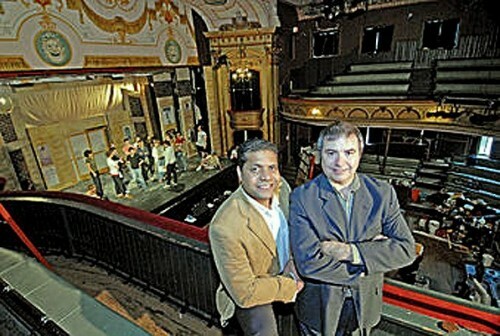 The shallow stage was crammed with the set pieces that host the rapid series of scenes that is the mark of Sweeney Todd. Because of limited backstage space, just about everything that is part of the show has to be on the stage. Did I say limited? That may be an exaggeration. There is barely enough room backstage for a few lights and drapes to hide actors before they come on. It is just one of the enormous challenges faced by this spunky little company. Their rehearsal time for Sweeney was only two and a half weeks, and so allowances have to made if not every detail was worked out. They weren't, but most were. Who was keeping score anyway. With the incredibly energetic Jim Charles taking on the role of Sweeney Todd everyone knew they were in for a good time. And thus the mayhem began. There is no overture, just a factory whistle that blasts and the ensemble arrives on stage. They fortell the tale of Sweeney Todd. He soon arrives with Anthony, the sailor who rescued him, capably played, and sung by Brendan Hoffman. Neither showy nor timid, he found the right balance for his character. Anthony was one of the few survivors of Sweeney's throat slitting rampage through London of the 1850s. In delivering his songs, Jim Charles was magnificent. His character, whose real name was Benjamin Barker, was separated from his wife and child early in their marriage. Todd was unjustly shipped off to an Australian work prison. Doomed to spend the rest of his life there, he escaped on a raft. He returned to his original barber shop located above Mrs. Lovett's failing pie shop. Soon he was reunited with razors and out for revenge on the powerful judge who wronged him and abused his family. As Todd, Charles' singing voice is strong and clear, and he sang lyrics with great force and feeling. Yet despite the threatening appearance of a shaved head and gruff demeanor, the actor chose a simple, plain delivery for his spoken lines. It was a risky choice that worked well. Evil often appears in the guise of the shockingly normal. "Murdered, all those people? He was such a nice normal neighbor, We just had no idea..."
The first victim, the blackmailing rival, Pirelli, was hidden in a trunk and almost got him in trouble. This inspired him to build a barber's chair over a trap door. This way he could deliver the corpses to the basement . There Mrs. Lovett would strip them of their meat, grind them up, and make pies. The public flocked to her establishment to eat the treats. Gory stuff. The razor used in the show tended to shoot its preloaded blood everywhere but down the neck of the victims. Nevertheless, the audience screamed and squirmed in discomfort. Someone seated nearby hinted that she would close her eyes and just listen. But you know how it is; everyone has to look at these bloody scenes, no matter how disturbing. 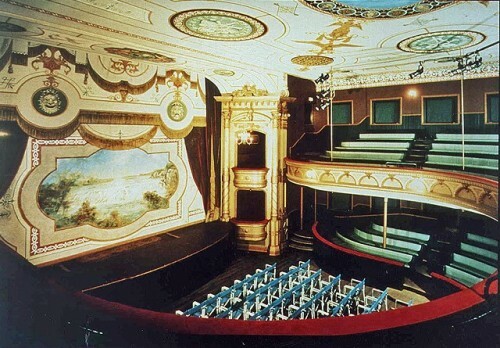 The show's set looked as if parts of it were borrowed from a Rocky Horror Transylvania set (turrets and such) while other elements were more successful in conveying mid 19th Century London. There was a ramp set up around the orchestra which was used several times to bring the players closer to the audience. It was fascinating watching the actors trying to pass each other. It was a dangerous business, and happily none fell into the musicians' pit. The Director of this production, Jerry Christakos, is a noted actor in his own right, and increasingly applying his talents and experience as a director. He kept things moving, mostly unobtrusively. He also mastered the balancing of the ensemble with the soloists in just the way Sondheim intended. The eight members of the group acts in many ways as the Greek chorus as the show proceeds. Thus, the ensemble is often at the lip of the stage singing directly to the audience rather than being window dressing behind the stars. Christakos' direction is the glue that holds this massive show together. Monica M. Wermitt was good as Mrs. Lovett, though the role is not the perfect fit for her more genial voice and bearing. She is one of our region's most gifted actors, and it was obviously a difficult and demanding role for her. Sondheim is not easy to sing, and there are fans everywhere who know every Sondheim note better than the players. Or critics. He is one demanding composer. There were some problems with miking. Sometimes the volume would suddenly rise or fall, making some lyrics hard to hear, others far too loud. Equipment or sound operator? Maybe a bit of both. There were also anomalies with the lighting, especially when various members of the ensemble were highlighted. Some cues were late, misplaced, and once the house lights suddenly came on. Whether it is the the fault of the operator(s), limited tech rehearsals, or simply that they need to update their lighting board is not clear. Let this be said as gently as possible: old, worn out theater bulbs don't burn out, they just grow dim. Very dim. And they are expensive to replace. Very expensive. But it needs doing. Back to the positive side, Lauren-Rose King as Johanna was not just good, she was delicious to both hear and watch. A lovely clear voice, solid delivery, and as a good an actress as singer. Brava! Joseph London as Beatle Bamford was also superb, and at times used his falsetto to great effect during the ensemble scenes. Glenn Wall as Judge Turpin was pleasing, especially on "Pretty Women" which is a deceptively beautiful song in a particularly gory situation. Adrian Gleason as Pirelli isn't given much of a solo, but filled his role well. Then there is Toby, the young assistant to Pirelli who Mrs. Lovett ends up adopting. Dan Lawler was absolutely perfect in every way in that role, except for his height. He didn't look like a very convincing boy, but if you imagined the role as one for some young, intellectually slow, apprentice, it worked. Lawler used his gifts as an actor to good effect. And the old beggar woman was played as naughtily as required by the script by a memorable Mary Elizabeth Milton. One hopes that the continued efforts to find the right balance between the sound level of the band and the players will continue to progress. There is nothing more wonderful than a live pit band for a musical, but some players have to more sensitive to what is happening on stage. There are times when fortissimo is essential, and others when pianissimo serves the singers better. Sometimes they got crossed. Overall the musical elements were usually well balanced. "When are auditions for Sweeney Todd 2014?"